Is ann am Beurla a bha gach pìos a sgrìobh e. Ach bha meas mòr aig coimhearsnachd Ghàidhlig Ghlaschu air agus tha seo ri fhaicinn anns an luaidh a chaidh a thoirt air anns An Gaidheal, iris a’ Chomuinn Ghaidhealach, nuair a chaochail e. An rèir seo bha an Rothach air a bhith a’ gabhail chlasaichean Gàidhlig le Donnchadh Reid (1849-1912), tidsear à Cinntire, aig an t-Àrd Sgoil an Glaschu. “nor should it be forgotten that Neil Munro spoke and wrote Gaelic. I am the fortunate possessor of several letters from Dr Munro written in the old language.” [cha bu chòir dì-chuimhneachadh gum biodh Niall Rothach a’ bruidhinn agus a’ sgrìobhadh na Gàidhlig. Tha mi gu math moiteil gu bheil grunnan litrichean agam a sgrìobh an Dr Rothach anns an t-seanna chànain]. Dealbh ann an seo, gu h-ìosal, de Niall Rothach a rinn William Strang ann an 1903. Tha e ann an Taigh-tasgaidh nàiseanta nan dealbh, an Dùn Èideann agus air a chleachdadh an seo le cead uapa. ©Scottish National Portrait Gallery, PG 928. 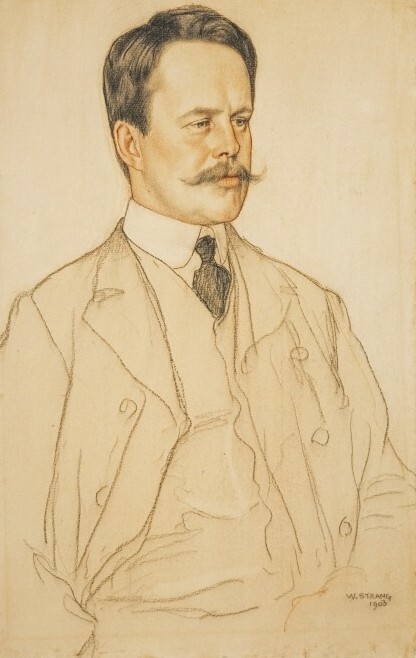 Ronald W. Renton, ‘Munro, Neil [Hugh Foulis] (1863–1930)’, Oxford Dictionary of National Biography, Oxford University Press, May 2006 [http://www.oxforddnb.com/view/article/40351, accessed 9 Nov 2013]. ‘Glasgow University Celebration of Commemoration Day’, Scotsman, 23 April 1908, p. 5. An Gaidheal, 26 (1931), 64-69. D.S. Thomson, ed., The Companion to Gaelic Scotland (Glasgow, Gairm, 1994), 34, 250. An Gaidheal, 26 (1931), 64-69.